From William Briggs Via Gloria TV. Very interesting and somewhat long. Please go visit! Really worth it. 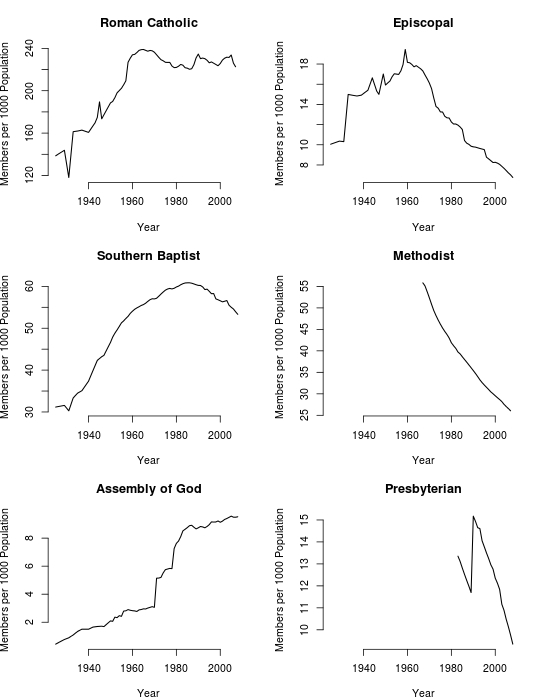 All the mainline denominations are plummeting, but the Catholics are holding their own, the Assembly of God and other similar pentecostal denominations are increasing, and while the Baptists have begun declining, the rate is not as alarming as it is for the others (see Southern Baptist Baptisms at Lowest in Decades). Catholics have even been increasing of late; much of this comes from immigration from countries which have historically adopted a conquering white nation’s language which is not English, and in congregations which are traditionalist. Mormons (not shown) are also on the rise; there are about six million of them at present. And the Amish and Mennonites (also not shown) aren’t doing poorly. The outlook for Catholics is sparkling. That bump you saw in clergy is no artifact (perhaps the exact number is; no warranty on the data, but evidence elsewhere suggests the priesthood is reviving). The increase in members will continue with immigration and because while some Catholics rebel when it comes to birth control, few do so when it comes to killing off inconvenient fetuses. Plus with the gradual return to more traditional services, and given what we have seen, membership will likely increase. He might be happy about those numbers, but I`m not. We Catholics should be making converts, and we don't. We shouldn't be "holding our own" we should be multiplying in spades! UPDATE at 12:07 pm: Replaced erroneous chart with correct one.